One of the most popular ways Laravel professionals build admin panels. Generate CRUDs for your Eloquent models. Then easily change anything you want, thanks to its simple architecture. Laravel professionals have been using it since 2016 to power everything from presentation websites to ERPs. Because it's easy to understand and use. And even easier to customize. Get started It's free to test and even free for non-commercial use. The powerful, flexible admin panel framework that Laravel professionals love. You worry about the admin panel's functionality. The theme will make it look pretty. Code Create-Read-Update-Delete interfaces at 10 minutes per Eloquent model. Battle-tested by professionals for everything from presentation websites to complex web apps (CMS, CRM, ERP, e-commerce, e-learning). Create all files needed for a CRUD with one command line. Backpack\Generators allows you, with one command line, to generate a migration, model, request and controller. Then you just need to go through these familiar files to customize your CRUD. Common use case? Don't start from scratch. The community might have already build a great starting point for you. 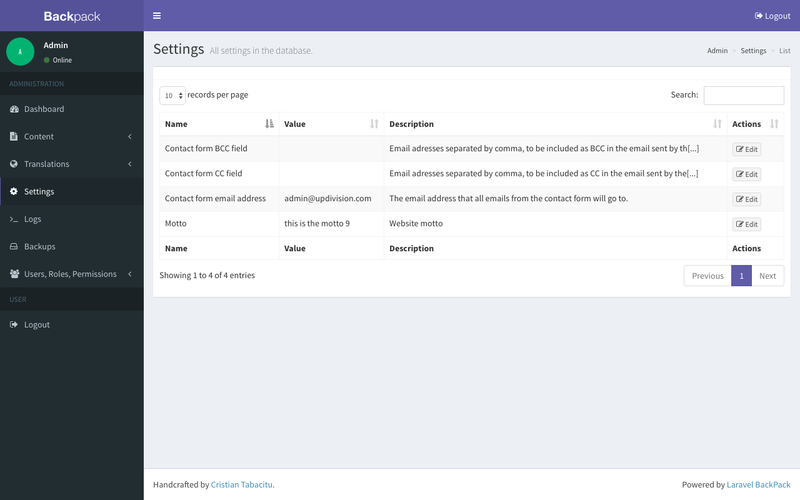 A CRUD interface to manage users, roles and permissions. In a matter of minutes you can build admin panels for presentation pages (home, contact, about us, etc). You define the page templates and what fields each template needs in the admin panel. PageManager does the rest. Add, edit, delete, reorder and nest menu items, with internal links, external links or links to a selected page. Add, edit, delete news articles, categories and tags. Create database and file backups and store them on server or in Dropbox, S3 Bucket, etc. Preview, download and delete the online logs without SSH-ing into the server. We have a 25-minute text course, an email course (5 min/day, for 5 days) and a 5 minute quick intro. Video course coming soon. Create an account Free for non-commercial use. Free to test.